Angling these days is not just about catching fish, it’s also about caring for the environment in which fishermen enjoy their sport. This is the philosophy of Goldsworth Park Angling Club, which manages Goldsworth Park Lake and two of the four ponds at Brookwood Country Park under licence to Woking Borough Council. The club has been spreading the word and encouraging novices at five free teaching afternoons on a pond at Brookwood and the lake. “It was a fantastic success, with over 40 people trying their hand,” said club secretary and fishing bailiff Roger Westcott. 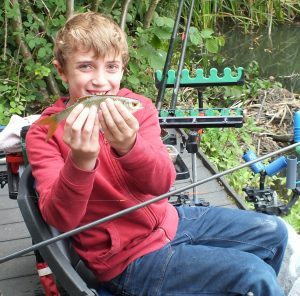 “The two most promising young anglers, 12-year-old Grace and seven-year-old James were presented with a trophy and angling accessories. 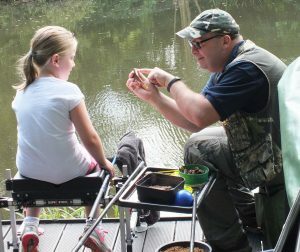 Professional coaches Richard Charlton and Simon Windsor, registered with the Angling Trust, were hired by the club to deliver one -to-one tuition. The novices were each given a goody bag containing a fishing pole, floats and line kit, a plummet, disgorger, beginner’s booklet and a certificate of participation. Most of these were donated by Thames Water and the Environment Agency. “Everyone caught lots of roach, rudd and bream,” Roger added. “One youngster caught so many fish we lost count, but his catch was not as big as the smile on his face. It’s those magic moments that make fishing and events like this so worthwhile. “We would like to give special thanks to Richard Charlton’s wife, Angela, for designing and producing the wonderful participation certificates. “It’s important that we seasoned anglers share our knowledge and experiences with future generations,” said Roger, who is happy to tell newcomers more about angling, the club and its activities. For information on Goldsworth Park Angling Club on the web visit http://bit.ly/2erYRSa. To contact Roger, call 07779 896393 or email rogerwestcott@mail.com.